ALMOST 34 HOURS AGO NOW, I GOT A MESSAGE ON MY FACEBOOK PAGE, FROM A FRIEND REQUESTING PRAYERS FOR HER FAMILY IN GATLINBURG, TENNESSEE. And I didn’t know why–until I saw a bloodcurdling video. Since then I have not slept. I have eaten some. I have barely used the restroom. Why? Because an American City went up in flames. And the MSM was too busy asking us to wear headscarves, or dissing Trump, or taking aim at Hillary, to pay more than passing attention to this unprecedented tragedy playing out on three local tv news sites in the area. Where there was at least some mention of this horrific series of events, and I began publishing my facebook timeline linked above–that is filling up with requests for volunteers, requests for donations, pleas for help locating lost friends and family, and pleas for prayers. In the long weary hours since that moment, I have shed a gallon of tears. I have prayed, tried to help people find local services under terrible circumstances, and refreshed those news pages 1000s of times, to make sure that all the news I could find was there. And I have been here ever since, passing on all the news locals and those real journalists in Gatlinburg have made available. And Yes, Some In Cyberspace Have Heard, and Responded. I want to give a shout out to THE CONSERVATIVE TREEHOUSE–who picked up my first pleas for help for fire fighters working without sufficient food, water, or first aid supplies. And my twitter followers who have retweeting my timeline over and over through these long hours. And my facebook friends that have also share my timeline, and strangers that have wandered along from wherever, with local information. Donald Trump Tweeted, THANK YOU PEOTUS!–Obama? Well…. As To The Erstwhile So-Called “Journalists” on National News? SHAME ON YOU. SHAME ON EVERY ONE OF YOU IN THE MSM WASTING YOUR TIME ON USELESS REHASHING OF CRITICISMS. 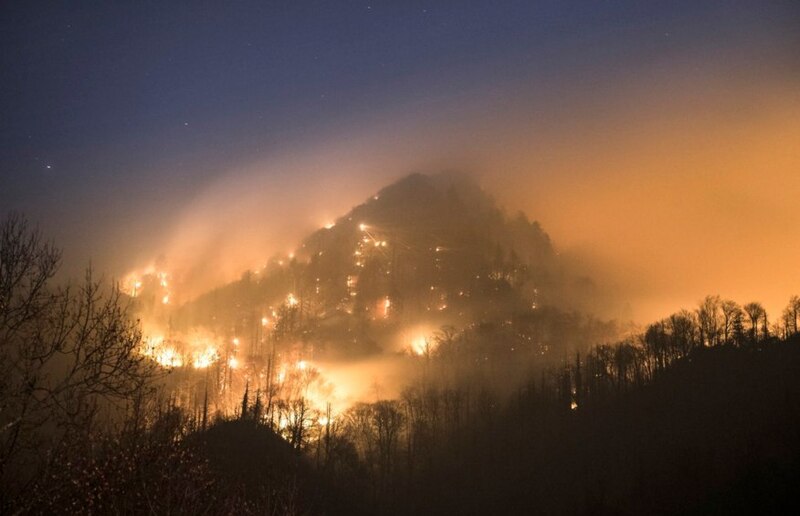 There are three heroic TV news teams in TN–WATE, WBIR, WVLT–who have been the only reliable source of continuous, accurate coverage of the fires–AND NOW THE TORNADOES–ravaging the Smoky Mountains. There are Two Newspaper– The Tennessean, and The Knoxville Sentinel that are also going far beyond anything MSM even thought of doing. While America has been trading insults and jokes in 140 characters, these professionals haven’t eaten or slept well either–they have gone deep into harm’s way to help those who need their help–AND TO REPORT THE NEWS. FOR ONCE WE HAVE REAL NEWS HERE, PEOPLE, AND BEING REPORTED–AND NOBODY IS PAYING ATTENTION. Where Is America This Deep Night? Where’s the America That has taken to social media after earthquakes, and terror attacks, to seek real news and help those who need it–if only with prayers? Where is the America I have been seeing during Donald Trump’s Campaign? Well, if you’re out there and are just now finding out about this–the link above is everything to date. And please–extend prayers–if nothing else. If you already knew, and are spending your time bitching about the FAKE NEWS ON MSM, THEN CAN YOU SPARE 5 MINUTES TO GO THANK THE REAL NEWSMEN AND NEWSWOMEN AT THESE THREE STATIONS? If you’re beginning to get the idea I am angry–good for you. Because I am. Americans are better than this. There is more to MAGA than tweets, and jibes at Mittens. There’s taking the extra 10 seconds to thank the only real jounalists in the country at the moment, and to tell your fellow Americans in Tennessee AND THE OTHER SOUTHERN STATES BURNING TONIGHT That even if the MSM has decided they aren’t important–you think they are. This entry was posted in gatlinburg stories, Gatlinburg Stories and tagged gatlinburg, gatlinbyrg fires, help for gatlinburg, journalism. Bookmark the permalink. ← Investing In Gold and Silver Part 3–The Markets Option. For those of us who know and are eternally grateful for our Lord’s blessings stories such as these give us more reasons to be thankful.